3. Start the copy that is running the controller and server. In a minute or two, it will show any renderers it finds under Playing Now. Click on the one you want. Then drag a file to it. This should play on the remote device. Media Renderers will appear under Playing Now (as zones) about 30 seconds after MC is started. When one is selected, any playback will be sent to it. Two DLNA Servers are shown in the list below (from MC/File/Library). Selecting one will open it as a library in MC. The Linkstation shown is a NAS drive that includes a DLNA Server. Any media moved to the drive will automatically show up in the MC library after the library is opened. 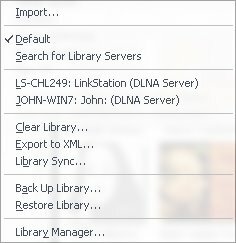 Two DLNA Servers are shown in the list above (from MC/File/Library). MC 14.0.127 introduced a DLNA renderer and controller, in addition to the previously existing DLNA Server (formerly known as the UPnP Server). The controller can play media from the DLNA server to another copy of MC. 1. In MC's Tools/Options/DLNA, turn on the functions you need in each copy of MC. Normally, this would be the controller and server on the machine you're playing from, and the renderer on the machine you're playing to. 2. Start the copy of MC that is running the renderer.